Hark, True Believers, and join us in discovering a New World. It is the year of our Lord 1602; in the Kingdom of England, under the reign of her Majesty Queen Elizabeth I, strange beings with incredible power have emerged. These creatures are "witchbreeds", to be feared and reviled by society. Awaken thine senses, and embrace the re-imagined history of Marvel's lionhearted heroes. 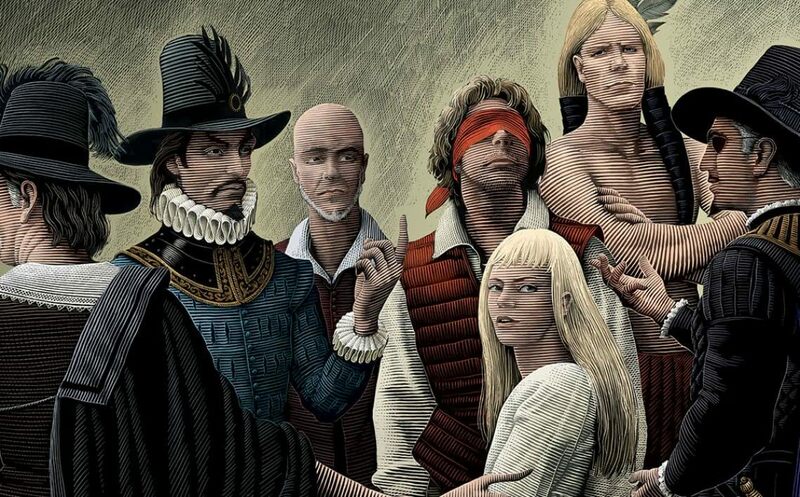 Writer Neil Gaiman whisks us to the past in the first issue of Marvel 1602. Queen Elizabeth grows concerned over the 'unnatural' weather plaguing England. Can Doctor Stephen Strange, Master of the Queen's Medicines, uncover the source of these disturbances? Sir Nicholas Fury of the Queen's Intelligence finds a new squire in young Peter Parquagh. Action culminates to a head in the final issue of Marvel's 1602 series. The witchbreeds have organized their forces, and are on the brink of revolution. Peter Parquagh finds he has only shape shifter Virginia Dare as a companion. Plus, the untold history of the Roanoke colony. Marvel 1602 heads across the pond, as adventure awaits witchbreed and human alike in the New World! But why do prehistoric beasts roam America's earliest colonies? The time stream is ripped askew, and the New World will suffer. Elizabeth's Scottish cousin has assumed the English throne, leaving David Banner in dire straits. Will King James I be as 'tolerant' of witchbreeds as his predecessor? In Roanoke, Spider-Man 1602 makes his untimely presence known, while Thunder Lizards continue to ravage the land. If colonists came to the New World seeking adventure, they won't be disappointed! Meet the Four of the Fantastick in this innovative retelling of Marvel's first family. In the opening issue we meet Galilean scientist Sir Reed Richards, and his pregnant, albeit invisible mistress, Susan Storm. Guest-starring the Bard himself- William Shakespeare! Peter David scribes this action-packed mini-series, featuring art from Pascal Alixe. The Fantasticks have their final confrontation with Count Otto Von Doom, leading to serious shake-ups for Emperor Numenor and Madame Medusa. Will the crew of the ship Fantastick stand defeated as the Watcher simply watches? Will Peter Parquagh return to the Queen's Country? In the New World, 'The Spider' has found his stride as companion to Virginia Dare, and liaison to Irishman Jonah Jameson. But with Norman Osborne seeking the source of the witchbreeds' power, Peter may find himself on a one-way ship to England! The Spider struggles to maintain his humanity in the stunning conclusion to Spider-Man 1602. Baron Octavius, previously seeking a cure for his octopus-hybrid form, now accepts his status as witchbreed. Guest-starring Henri and Janette Le Pym, the ever-shrinking and growing couple of the New World!